MOUNT AIRY, NC— Experienced pullet farmers know the first three days is the most critical time in a chicken’s life. And in colder winter climates the right insulation of the pullet starter house can make all the difference in the profitability of raising healthy chickens. Greg Fortkamp, a third-generation poultry farmer in Fort Recovery, OH, (avg. Jan. low 15 degrees/avg. 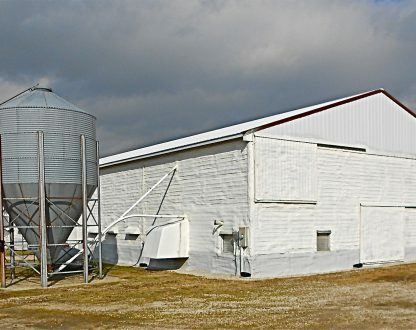 high 32 degrees) used AgriThane high performance spray foam insulation (SPF) by U.S. company, NCFI Polyurethanes on his 48 ft. x 305 ft., metal, cage-free pullet house to ensure more of his 30,000 pullets survive and get the best possible start to life. Fortkamp says “cage-free” pullet houses, or a barn structure in which the pullets are not kept in cages and allowed to range freely in the space, are high maintenance. “Cage-free allows for more comfort behavior, which is important for body maintenance such as stretching, flapping, shaking, and preening, and there’s more opportunity for natural stimulation, but is hard to regulate and keep consistent.” According to Fortkamp cage-free buildings require the farmer to plan well, and fully insulate and ventilate the building. Fortkamp says he chose AgriThane for four “great” reasons: “I own an insulation company, Fortkamp Foam, so I’ve seen first-hand how SPF comes out of the spray gun, fills every crack and crevice, and cures in place to form a monolithic building envelope. This spray-in-place insulation seals air leaks and doesn’t require a separate vapor or water barrier. It allows building ventilation to work the way it was designed. NCFI is a U.S. company headquartered in Mount Airy, NC since 1964 with manufacturing facilities in Salt Lake City, UT, Dalton, GA, and Hickory, NC, and 14 distribution warehouses around the country. NCFI manufactures polyurethane foam chemical systems for high-performance spray foam-in-place (SPF) insulation (InsulStar, InsulBloc, Sealite, AgriThane), roofing (EnduraTech Systems), geotechnical (TerraThane), marine floatation, packaging, specialty molding, and many other uses. The company also offers a complete line of flexible foams for furniture seating, transportation seating, bedding, carpet underlay, and packaging. To learn more about NCFI please visit www.NCFI.com.